The limited-time flavors from Brooklyn-based Ample Hills Creamery represent elements of the Resistance, as well as both the Dark and Light Side. Disney, Lucasfilm, and Brooklyn-based ice cream maker Ample Hills Creamery are yet again using the Force to offer the Jedis, Siths, and resistance fighters among us an exclusive line of ice cream flavors. Between pop-up bars and punch tie-ins, fans of the ever-expanding Star Wars franchise have a handful of ways to keep themselves and their taste buds busy in the lead up to the December 15 release of The Last Jedi. Ample Hills Creamery is joining this intergalactic food and drink celebration with three new and limited-time flavors—First Order, Resistance, and The Force—all inspired by the heroes, villains, and messages of the latest installment. The first flavor, a salted dark chocolate ice cream with cocoa powder, bittersweet chocolate, and a dash of powerful espresso is meant to represent relentless villainy and the dark, fierce power of the Kylo Ren-led First Order. The second flavor, a tribute to the spirit of the Resistance, combines brown sugar and vanilla bean ice cream with fiery red velvet butter cake, toffee pieces, and marshmallows to represent tenacity, ferocity, and hope. The Force is the final flavor and uses sweet cream ice cream, swirled with rich chocolate fudge, and white and dark chocolate pearls to illustrate the sensitive balance between the dark and light side. To make this latest roll out of film-inspired flavors a reality, the Ample Hills team immersed themselves in the Star Wars universe, learning the ins and outs of the mythology and language so they could build a story for each flavor and design the signature watercolor artwork for the packaging. While themed and timed around the release of The Last Jedi, this is not the first time the beloved Brooklyn ice cream maker has delivered Force-sensitive flavors. As part of the lead up to The Force Awakens, the creamery released two other limited time flavors representing both The Dark and The Light Side. Officially endorsed by both Disney and Lucasfilm, this sweet collaboration was the result of Disney CEO Bob Iger’s taste for the ice cream shop’s offerings. Iger now serves as a business mentor to Ample Hills CEO, Brian Smith, and has assisted him with opening up more locations, including a spot at Disney’s BoardWalk Inn. “..[I]f you would have told me at age seven that one day I would be making Star Wars ice cream with Lucasfilm, I never would have believed it. 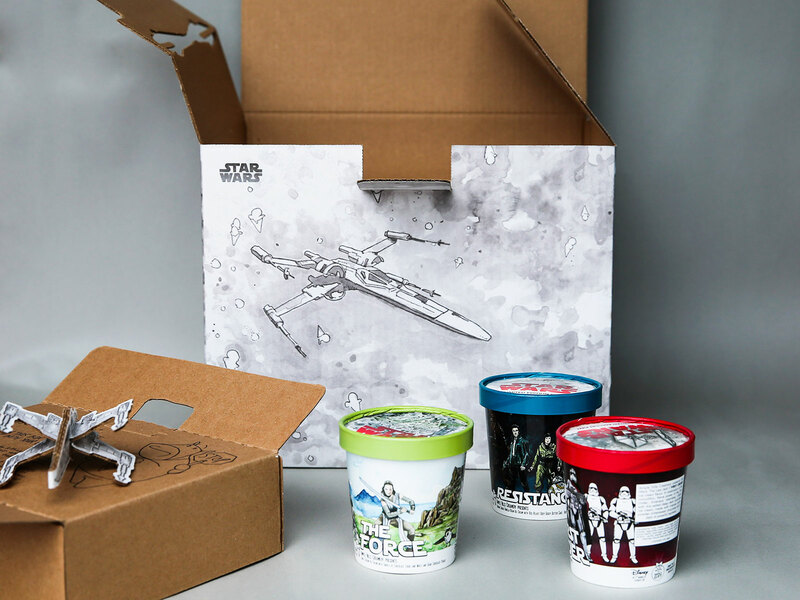 It’s the thrill of my adult life to be able to tell these three Star Wars stories through ice cream,” Smith says. Whether you’re a new or old Star Wars fan, living in Brooklyn or beyond, there’s a number of ways you can master the Force to get your hands on these limited time flavors. They are available for purchase through the creamery’s online shop, Fresh Direct in markets throughout the Northeast, at Ample Hills store locations, and at select Whole Foods and specialty retailers across the Northeast.